The WELCOMMON Hostel has a quite uncommon, interesting history. For many years the building was used as a public clinic. During the Greek economic crisis, in February 2013, the clinic was shut down and merged with a bigger hospital. We, the social cooperative Anemos Ananeosis / Wind of Renewal –working for the promotion of the social and green innovation and economy– began renting the building in August 2016. We refurbished it in order to transform it into an innovative center – WELCOMMON – for the hosting, holistic support and social inclusion of the most vulnerable refugees. In 1,5 year, from 9/2016 until 2/2018, we hosted 600 vulnerable refugees, between others 41 newborns were hosted . You can feel the history of the place not only through some painting and photos but also through the employment of some of the previous guests. The project was not simply meant to be for the refugees but with the refugees –working with them for their benefit, as well as that of the neighborhood and the local community. It became one of the most innovative and creative centers for hosting, empowering and socially including refugees, based on the idea of “empowerment through the community”. It was supported by the Development Agency of the Municipality of Athens and the UNHCR. But these agencies decided that refugees should be hosted only in apartments, there is no need for transition structures. Read about this HERE. The center closed in March 2018. We decided to start refurbishing the seven-floor facility located in the centre of Athens, and to transform it into a HOSTEL, but not just any kind of hostel! 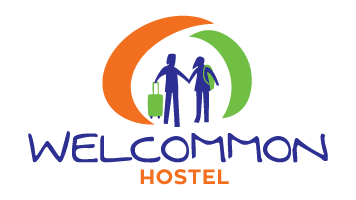 Now we are running the WELCOMMON Hostel, a social hostel combining sustainable tourism with social and cultural activities and job integration for Greeks, migrants and refugees. The WELCOMMON Hostel applies all standards and principles of the hospitality sector. But we are still active in promoting non formal education, social and job integration of the most vulnerable social groups (unemployed Greeks, refugees, migrants) with the cooperation and participation of many volunteers from all over the world.We aim for Welcommon to be a social experiment, a centre of innovation and art, and for social and employment integration. And of course a hub where travellers can get insider’ information to organize their trip in the city, discover interesting social events and groups, but also information on other Greek cities, Islands or villages. You can learn about our model, a community model, for the protection but also the inclusion of refugees, migrants and Greeks. It is a model we could adjust for vulnerable social groups, too. Although the center for refugees closed, you can experience some of our new activities, participating in workshops, language and painting, photo exhibitions, video or info-material. But you can also meet some of our previous guests, working now for the WELCOMMON Hostel, being part of our new community.